Support Holland’s irreplaceable musicstation, De Concertzender! 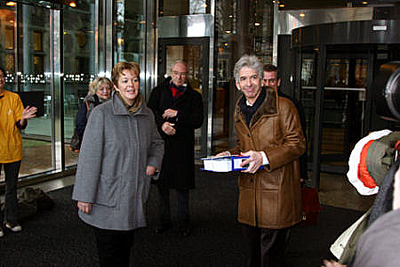 On monday, 24 november 2008, at 12.15 PM in The Hague, the Minister of Education, Culture and Science in the Netherlands, Ronald Plasterk, met a delegation of employees of De Concertzender. Managing Director of De Concertzender, Gusta Korteweg, presented him a petition that pleads for the preservation of De Concertzender in its present form, radiodistribution included. After receiving the petition from the Concertzender-delegation Minister Ronald Plasterk commented shortly that he considers De Concertzender an important station and he promised to do his best for its cause. On thursday 13 november 2008 De Concertzender was informed of the decision by the board of the NPO (Nederlandse Publieke Omroep) – the Board of the Dutch Public Broadcast Service – that they plan to stop all funding for De Concertzender in its present form. The option left for De Concertzender is -according to this plan- contributing a few of its programmes through 3 digital themechannels that are to be distributed via internet. Implementation of this plan will be the death penalty for the unique 24-hour programming of De Concertzender and a lot of other great contributions by De Concertzender, such as the recording of 250 concerts evry year, the promotion of young musicians, ensembles and composers, the education and development of young radio producers, the intense documentation and promotion of evry aspect of Holland’s music culture, the cooperation with venues, conservatories and festivals, the already existing rich output of music via Concertzender’s 13 themechannels and the great ‘on demand’-service. As a provider of all these unique and high quality services at an extremely low budget De Concertzender has proven to be an irreplaceable musicstation in the dutch media landscape, fulfilling like no other its duty as required from dutch broadcasters. 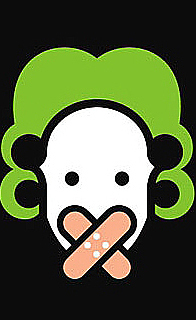 Listeners, musicians, composers, music teachers, impresario’s, ensembles, festivals, venues, conservatories and many colleagues are shocked by the decision to pull the plug on De Concertzender. Recently they’ve responded in great numbers to protest against this and to give their support to De Concertzender. De Concertzender started broadcasting in 1983 ; De Concertzender features a 24-hour broadcasting service ; The yearly budget of De Concertzender: 500.000 euro; De Concertzender costs 57 euro per hour ; De Concertzender has 135.000 listeners via internet evry month, there’s probably also a considerable listenership via cable, Digitenne and ‘on demand’, but figures of those are not available ; Right now 3 of the 4 most popular programmes on Radio 6 are produced by De Concertzender ; De Concertzender runs on 140 volunteers and 14 paid (parttime) employees ; Until the foundation of Radio 6 in April 2007 De Concertzender had costless (analogue) cable distribution throughout Holland, after the loss of its 24-hour cable distribution De Concertzender had to focus on internet distribution, and did so with considerable success after many well received innovations ; Meanwhile programme boards all over Holland have opted for the return of De Concertzender’s 24-hour programming on cable and advise to include De Concertzender in the basic supply of radio services. … OR NOT TO BE? Are you interested in De Concertzender’s unique and excellent programming of jazz, opera, world music, early music, classical music, avant garde pop and contemporary music? Take a look at De Concertzender’s website and enjoy its great service. This entry was posted in Multimedia, World Music and tagged Concertzender, Dutch Public Broadcast Service, Gusta Korteweg, media, minister education, music radio, Nederlandse Publieke Omroep, Netherlands, NPO, radio, Ronald Plasterk, science and culture by Pieter de Rooij. Bookmark the permalink.